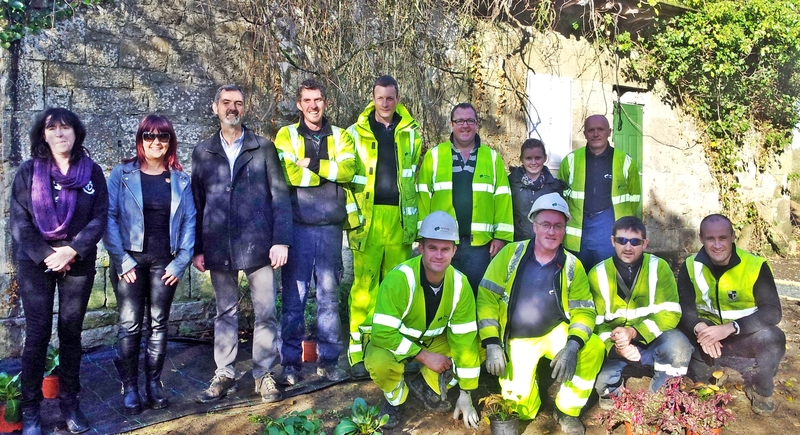 Monaghan Tidy Towns have taken the disused lock house at Rooskey under their wing. With help from Council horticulturalist Dennis Flannery and manpower from the Court Probation Service, supervised by Gerry Murdock, the overgrown garden around the lock house has been cleared, pathways laid and topsoil spread. On November 5th 2014, eight Airtricity workers gave a day’s labour to the project, and sunk fence posts and started planting. The nearby Hillgrove Hotel provided the volunteers with a hearty lunch as a reward for their labours. When finished, the garden will yield fruit including apples, gooseberries and blackcurrants, as well as plants which are used in traditional home medicines such as marigolds and lavender. The garden is open to the public, who are welcome to take produce – and to add plants of their own! The Lock House was occupied until the 1990’s. The last people to live in it were Joe and Joan Mallon, who own the land opposite it. During a bat detection training evening organised by the Tidy Towns Network in June 2014, we discovered that the lock house is being used as a roost by Soprano Pipistrelles, making it Monaghan’s most up-market Bat Hotel!